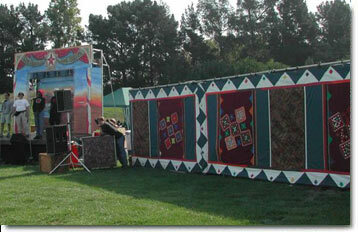 In Tents backdrops and walls are the heart of our unique look. Ethnic masterpieces hand appliquéd in the alleyways of the Cairo bazaar or embroidered Indian tapestries quilted in our barn workshop are installed by our capable team in event-specific arrangements. 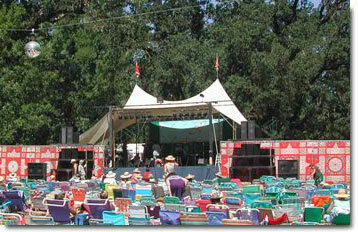 Festival promoters extend field wall on both sides of stages to protect green rooms and staging from public view. 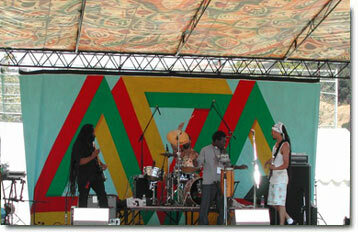 Murals appear as city-scape exteriors or backdrops for stages. When your preference is crisp and white, build your own theme on our white screen walls. 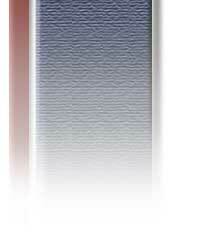 Delightful for summer weddings they allow the breeze to flow and put a soft filter on surrounding gardens. They keep the shade under the tent while the sun moves; an important feature if tables and chairs are under the tent roof. 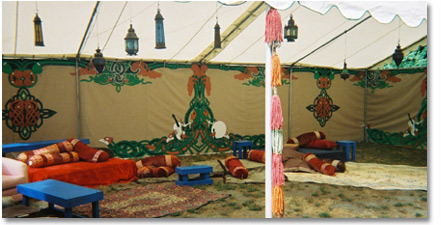 Egyptian tent panels set up as field wall. India wall protecting the backstage as field wall. 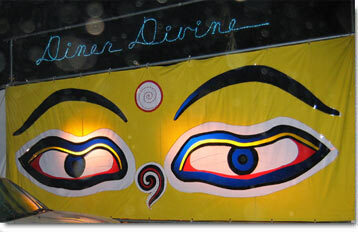 The Buddha eyes may be the world's only roll up "stained glass" window. 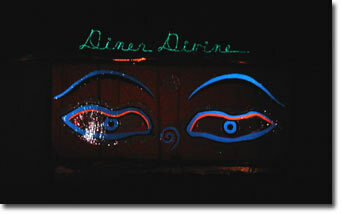 They made their debut at the 2004 Earthdance as part of the Diner Devine tenting. They make a splash with their bright colors in the daytime and can be seen from hundreds of feet away at night. Everyone's favorite backdrop the Egyptian applique. The Celtic Walls are an ongoing mural by Tinker Lamb. 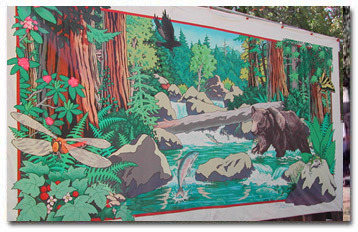 Every year his 56 foot painting becomes more complex. 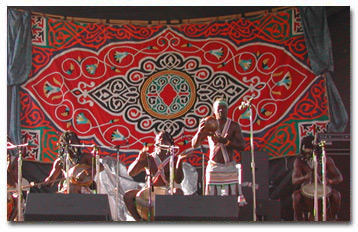 The Bear, painted by Paul Bourgoise, has been used at weddings and on stages behind speakers.